Whether you are a professional athlete or a gym junkie, if you think you are doing your health a lot of good with over-exercise, then think again. It can cause serious harm in the case of magnesium deficiency. In some cases over-exercise or over-training has even resulted in cardiac arrest and death on the track. We lose a lot of magnesium under stress. When you push your body hard you not only sweat out a lot of electrolytes and water, but also cause higher amounts of magnesium excretion via urine and faeces. This accelerates dehydration. Electrolyte replacement means a lot more than just sodium, calcium and potassium, as these electrolytes all rely on magnesium for regulation of balance. Before the others are affected, it’s always the magnesium that goes down first. Tragically, many sports drinks focus too much on the other electrolytes and not enough (or any) on magnesium. Also, beware of those with sugars or chemical sweeteners, as these can stimulate acid production, inflammation and depression of magnesium. To make matters worse, the release of stress hormones (catecholamines) from over-exercise releases free radicals and causes acidosis. The more acid (lower pH) the less we can absorb oxygen to burn for energy. The most efficient energy production is the burning of fats and for that we need magnesium and oxygen. Not only does stamina suffer when we are not producing energy from fats, but the less available oxygen, the more acidic the cells become and the faster we ‘dissolve’ and burn ourselves out. Carbohydrate metabolism and digestion of proteins both produce acid byproducts, which may lead to further escalation of inflammation as pH gets too low. Inflammation and pain are a sign of magnesium deficiency. Magnesium is a well-known natural anti-inflammatory because of its calcium antagonism. It can push the calcium back out into the extracellular spaces and calm down the fire of inflammation. To buffer low pH, magnesium, bicarbonate of soda and other antioxidants like vitamin C have a protective effect to replenish oxygen and refresh cells. Whole raw sea salt in your diet is also a great way to top up a whole package of essential minerals naturally, but there is not enough magnesium from that source alone. It’s hard to get enough magnesium from foods these days because of modern farming methods and excessive chemical exposures. On top of it all, if you over-exercise or have other overwhelming stresses in your life the body finds it very hard to keep up with its internal repairs and cleaning process. Sport enthusiasts, athletes or those with jobs requiring heavy physical exertion may need over 1,000mg of magnesium a day to replace what is lost, but that’s almost impossible to absorb with diet alone. You will need the help of transdermal magnesium to top up your levels in the case of higher needs. Swimming/soaking in the ocean every day can give you an extra amount to supplement diet. As magnesium levels drop lower we can get cramps and restless legs, find it difficult to relax or sleep properly, and also experience hardening of ligaments and joints which get stiff, gristly and crunchy – making us prone to injuries. Low magnesium also makes the healing process slower after injury. 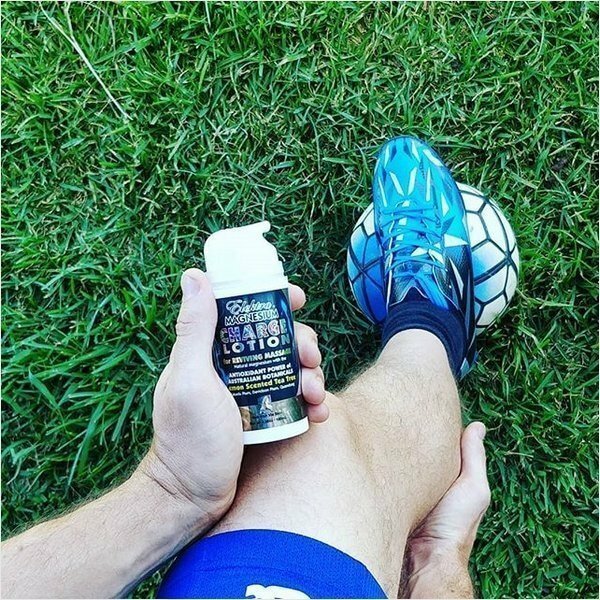 When you have optimal magnesium it helps muscles recover faster, increases energy production, endurance and performance, and it makes muscles and ligaments more flexible and stretchy because magnesium helps production of collagen and elastin. It also provides strength and shock-absorbing capacity for bones. You don’t want to break easily if you fall. Gym junkies – take heed if you want to stay younger longer. Overloading your body’s reserves with over-exercise when magnesium levels are low causes even more magnesium to be lost. This leads to cell membranes losing integrity and allowing too much calcium to enter the intracellular spaces which causes over-stimulation and hardening. Free calcium floating around in the blood can lead to blood thickening and lowering of pH, dehydration, hypertension (high blood pressure) and thrombosis (blood clots). In an endurance challenge magnesium deficiency can cause heart arrhythmia and even cardiac arrest. There are more magnesium receptors in the heart than any other muscle in the body. That’s how important magnesium is to the heart! With chronic magnesium deficiency calcium can leach out of the bones causing osteoporosis or the precursor to osteoporosis – osteopenia. More people in their 20’s and 30’s are experiencing these kinds of bone disorders. Less bone density and more calcium deposits in the ligaments and joints is a sign of premature ageing! Magnesium is the controller of the calcium. When magnesium is low calcium causes havoc and can prime the body for inflammation. Many studies are now showing how calcium fires up inflammation and magnesium puts that fire out. Unfortunately many sporting bodies and doctors are still recommending calcium and vitamin D supplements to treat osteoporosis, which is actually an indicator of magnesium deficiency. Synthetic vitamin D in tablets (not the natural vitamin D you make in your skin from sunlight exposure) has been shown in scientific studies to attract more calcium aggregation, which blocks the activity of magnesium. This just tends to inflame the problem, causing more anguish, pain and swelling. Magnesium is also essential for your mitochondria to make energy currency – adenosine triphosphate (ATP). ATPs are your little electrical energy storage batteries that kick into action with a big exertion. If you don’t get enough magnesium you can’t make enough battery storage and therefore stamina declines. Low magnesium leads to drop in voltage of cells and can also depress immune function – leaving you vulnerable to pathogens wanting to eat you for lunch. This shows up as an increase in cold and flu symptoms, asthma and bronchial infections. If you eat a fresh food diet with green vegetables, legumes and dairy you would be getting ample calcium from those foods. However it’s the magnesium that controls how the calcium is used in the body. If you have enough calcium, but magnesium is low, you can even get calcium deficiency symptoms which disappear when magnesium is restored. Too many people today are being talked into over-calcifying themselves, which depresses magnesium. Other ways to rob your body of vital magnesium are chemical exposures, including ingestion of fluoridated tap water or beverages made with fluoride water; alcohol or drug abuse; a diet of processed foods; and over-consumption of proteins (including liquid protein supplements). If you are drinking protein supplements then you are likely to need a lot more magnesium than merely what diet can supply to replenish magnesium stores. Transdermal magnesium is a safe and reliable way to supplement dietary magnesium. Nutrition via skin is fast and effective because you don’t have to wait hours for your digestive system to digest and absorb a little bit of magnesium from tablets or powers (which contain fillers and binders). For a relaxation detox you can soak away the troubles of the day with a magnesium flakes bath or footsoak. This also promotes a deeper sleep. Do it half an hour before bed for 30 minutes for best results. Use Elektra Magnesium Cream (15% MgCl) for relaxation massage and muscle recovery. It’s also a great skin care product. For more acute conditions use Elektra Magnesium Charge Lotion (30% MgCl) or Elektra Magnesium Oil Spritz (60% MgCl). It doesn’t matter which products you use or in what combination. Because there is so much variation form person to person in magnesium requirements it’s best that everyone tries different methods to work out what suits them, their skin and lifestyle best. You cannot overdose in magnesium using the transdermal method, so don’t be afraid to be generous with yourself. When you are getting enough your body gives you the feedback. One last note about adequate hydration. Magnesium does its best work with water in the body, so make sure you keep hydration up. If you drink demineralised filtered water you will find yourself peeing too often but not maintaining a good hydration level. Mineral water is the best kind of water for cell hydration. 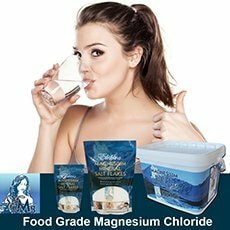 Elektra Magnesium flakes are food grade and can be used in filtered drinking water to alkalise and remineralise. This electrolyte charged water improves the hydration ability of the water. Cells love it and will soak up more water and be able to flush out more toxins. This also helps blood fluidity and blood pressure to be maintained in the normal range. When you get enough magnesium you can exercise more, recover better and improve performance and stamina. Over-exercise needs to be balanced with more magnesium because stress demands high levels of magnesium in order for the body to recover properly.